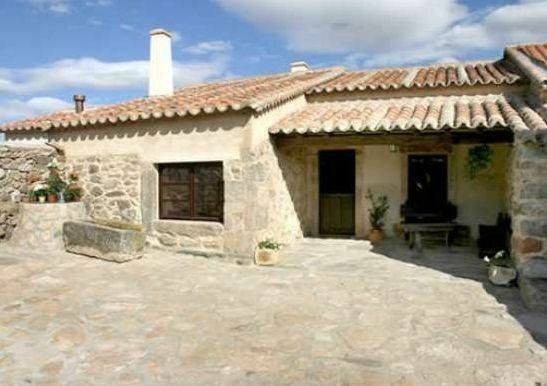 La Solana del Abuelo is a country house placed in an old house made of wood and stone. It has all the today facilities and has maintain the authentic old town flavour. Placed in Palacinos, small village annexed to Añover de Tormes, among oaks and small hills. This is a strategic place in the northeast of the region Salamanca from where you can visit Salamanca city (32 km), Zamora (40 km), walk across the natural park of arrives del Duero and enjoy Ledesma and its area. El Cernidero or living room of the house is the ideal place to enjoy the time you spend with your family or friends. Tv, books, magazines, games and tourist information. El Hogar is the cosy dinning room where you can spend long happy moments. The old pantry is today a nice kitchen well equipped. Fridge, dishwasher, washing machine, microwaves, toaster, squeezer, mixer, coffee maker, dinner service and kitchen ware. La Sala de los Abuelos is the double room ensuite with the possibility of an extra-bed. La Alcoba is a double room ensuite. Las Paneras is the double room ensuite. Sheets and blankets, towels, hair dryer and iron. Nowadays this country house offers the privilege of sharing a traditional way of life and allow us to enjoy the authenticity in an unforgettable rural tourism experience. We offer you the possibility of visiting our smallholding where we breed lambs, calves and you can come with us to feed the cattle. Hemos estado este fin de semana 6 amigas en este alojamiento. He de destacar la casa, perfecta en limpieza, equipamiento... Ninguna sorpresa pues es tal y como se ve en las fotografías.Trato con los propietarios magnífico. Es una casa rural aislada donde la desc onexión total es posible, ideal para olvidarse del estrés. Aconsejable 100%. Gracias Pepe y Ana. Muy buena atención de Ana y su familia, la casa muy limpia, cuidada y con muchos detalles. Especial para viajar con amigos o en familia. Ideal para descansar y disfrutar sin ruidos. Bien comunicada para visitar Salamanca, Zamora y los Arribes de Duero. Preciosa casa, muy especial, comoda, acogedora, impecable, no hemos echado nada de menos. Increible para disfrutar del silencio, del cielo estrellado que parece dibujado y de las carreras por los alrededores con los perros. Gracias Ana y Pepe por hacer posible un sitio asi, por vuestra atencion y recomendaciones. Sin duda cuando regresemos por la zona repetiremos. Un placer!